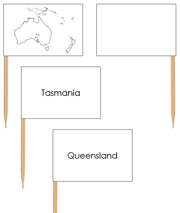 Blank, colored, labeled maps of Australia. 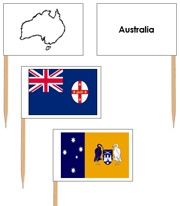 12 State & Territory pin flags of Australia. 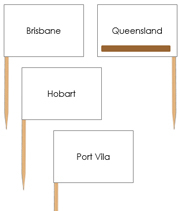 Maps of Australian capital cities. 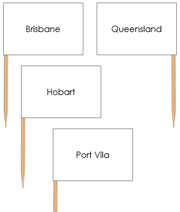 Pin flags for Australian capital cities. 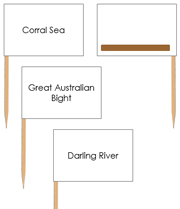 Pin flags for major Australian waterways. 30 Fun facts about Australia. 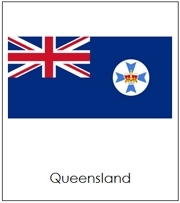 12 Flags of Australia in 3-part cards. 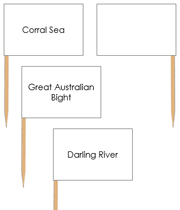 12 Outlines of the Australian flags. 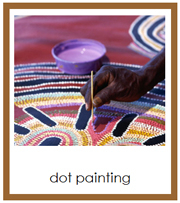 20 Photographs that show the people, their life and images of Australia/Oceania. 18 Photographs of the animals of Australia/Oceania in 3-part cards. 11 Photographs of the culture of Australia/Oceania in 3-part cards. 18 Photographs of the foods of Australia/Oceania in 3-part cards. 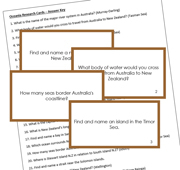 18 Photographs of the landmarks of Australia/Oceania in 3-part cards. 23 Photographs of the musical instruments of Australia/Oceania in 3-part cards. 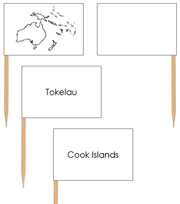 Blank and labeled maps of Oceania. 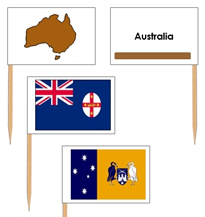 29 Pin flags of Oceania. 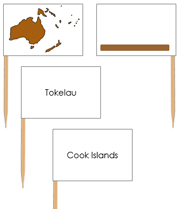 29 Pin map flags of Oceania. 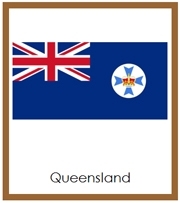 29 Flags of Oceania in 3-part cards. 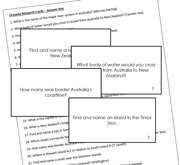 29 Outlines of Oceania flags.